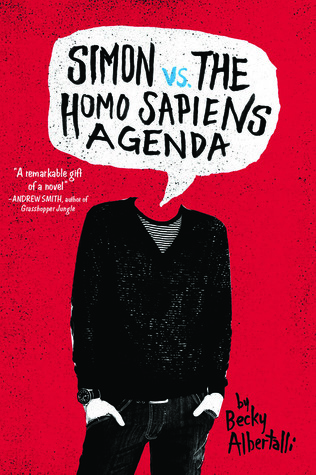 So Simon vs. the Homo Sapiens Agenda was a totally fun, entertaining, and heartfelt book. Simon’s narration was so clear and genuine. His experiences brought me back to high school: the cringe worthy moments, first loves, and new experiences. So I listened to this on audiobook and I would recommend that highly! The narrator does an excellent job of portraying Simon’s narration style. It also feels much more like a journal entry, like his own personal thoughts. I haven’t read the book on my own, so I don’t know how the experience compares, but I love when a book is narrated through audiobook in first person. What sets Simon vs. the Homo Sapiens Agenda apart is definitely its characters, Simon in particular. He is entirely lovable for all the right reasons. It isn’t because he’s perfect, or because he’s flawless, he makes mistakes and he realizes. But he’s doing the best he can. Simon is lovable because I think we can all find a bit of ourselves, or a lot, in him. The gay relationship, which features as the center of this book, is absolutely wonderful. It is quirky and unique and it has such a personality. Personality. I think this book oozes it and I loved it. I loved that we get that dynamic sense of Simon’s energy from the beginning. The side characters have so much personality and I am so excited for Leah on the Offbeat as she is one of my favorite characters (and Abbey, or Abby? I never saw it in print!). Simon vs. the Homo Sapiens Agenda is real. It’s cute. And it’s a story that demonstrates growth, the importance of friendship, and the foundations of family. Go grab yourself a copy at on Goodreads. How was/is your high school experience? Sum it up in 4 words! Four words? Eek! Oh, that’s not one of them, I haven’t started yet, just thinking aloud, or through my fingertips! Ok, here goes: awkward, self-conscious, illness, hormones! There, done it!